How to disable start up sound on Windows XP? When I turn on my laptop running on Windows XP, I can hear a sound as a part of starting up windows. It is quite annoying while I am in between an important meeting. What should I do for disabling it? How to disable individual sound elements of my Windows Phone 8? Procedure to disable Windows XP professional logo at startup? Re: How to disable start up sound on Windows XP? You should first of all locate the ‘Control Panel’ option after clicking on the ‘Start’ button. After that, you should click on that option and then on ‘Switch into Category’ option on the left pane of the ‘Control Panel’ window appears on your screen if it is in ‘Classic View’. 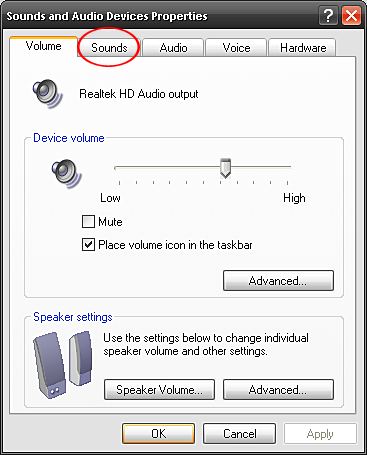 You should then click on the ‘Sound, Speeches and Audio Devices’ option on the right pane of the window. Then, you should click on ‘Sound and Audio Devices’ option available to view a dialog box. You should click on the ‘Sounds’ tab afterwards and click on ‘Start Windows’ from the ‘Program events’ option. You should then select ‘None’ from the drop down list given under ‘Sounds’ option at the lower part of the box. After that, you should click on the ‘Apply’ button available to disable the start up sound. 1. Start then Settings and go to Control Panels then selecting the Control Panel "Sounds and Audio Devices". 2. Click on the "Sounds" tab. 3. Scroll down just a bit and you'll find Start Windows and Windows Logon. 4. To Disable You need to also click on the pop-up menu, but this time you're interested in the top option. Now you are searching for how to disable start up sound on your windows xp, then you don't worry it is every easy process by following my instructions mention bellow step by step follow carefully..
After that you need to click on the start button. After that click on the control panel option. In that you need top select the switch into category option by viewing the classic view. Now here you need to observe the many options like sound, speeches and audio devices option. In that Then, you need to select the sound and audio devices option and after that click on the sounds tab and then click on start windows from the program events option and after that select the none option and then click to apply tab and that's it. Now you will never start up sound while starting your laptop. 1.Click on start and then on the control panel. 2.Under control panel select Sounds and Audio Devices. 3.In the window that appears click on the sounds tab. 4.Under the program events scroll down to find the option start windows and click on it. 5.Under the sound bar select none to disable the start up sound. Double-click on sounds,speech and audio devices. Now click on sound and audio devices. Search for Start windows under program events. Click it and go to sounds tab and make it as none. 1. Click on START > Control Panel. 5. Look below for Program Events. Scroll down and look for Start Windows. 6. First, highlight Start Windows. Second, go below to Sounds and select (None). 3 A new window will appear in front of you, click on sounds tab in the window opened in front of you. 4 Select sound scheme as none. A simple fix is just mute your computer. scroll down and look for windows sound. click on sounds and select none. 6. Click on the Sound and Click there to uncheck and to disable the sound. Step 1 Click the start button, then go to the Control Panel. Step 2 Open the Control Panel and click the "Sounds, Speech, and Audio Devices" button. Then click the "Sounds and Audio Devices". Step 3 Open the new window. At this window, you will find Tabs and click on the second tab, labeled "Sounds"
Step 4 you will see all of the Windows sounds. Scroll through the sounds until you find "Start Windows". Step 5 Under the area where you found "Start Windows", you will see a "Windows XP Startup" if you clicked on the sound. Step 6 If you can change this sound to anything sound. If you scroll all the way up, you can find "(none)" which makes it silent. Step 7 After that, Click "Apply" at the bottom of the screen. Steps To Disable Start-Up Sounds In Windows X.p. Start then Settings and go to Control Panels then selecting the Control Panel "Sounds and Audio Devices"..Click on the "Sounds" tab.Scroll down just a bit and you'll find Start Windows and Windows Logon.To Disable You need to also click on the pop-up menu, but this time you're interested in the top option. Select "None" & click on "Apply" and you should be able to restart your compute. Finally Save your Settings & you are Done. now browse through "program events" look for "start windows"
and click on it,and in drop down menu called "sounds" select "none"
and then click on apply and then ok.
->Go to start button and select control panel. ->By click on the control panel it will display some options. ->You can select the Hardware and sound option. ->So by going on their you can visible the sound option go for it. ->By click on it you can able to appear the dialog box so from there you can able to seen the sounds option go for it. ->So from the above you can easily understand the process. In order to get it, Follow the steps. Its done.No issues will there. 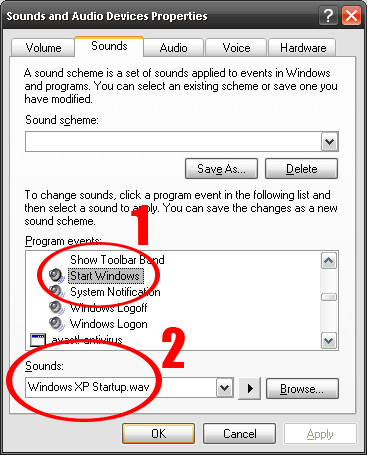 Follow these steps to disable start up sound on Windows Xp. 1. Open Control Panel by clicking on Start Button. 2. Then open Sounds and Devices option. 3. Now click on Sounds tab. 4. Under Windows option, there is "Windows Logon". 5. After selecting "Windows Logon", uncheck the box "Play Windows Logon on Startup". Your startup sound on Windows Xp will be disabled. 2)Click on Hardware and Sound. 3)Under Sound Options, click on Change System Sounds. 4>click on "sound and audio devices"
7>click on in and go to sound tab and uncheck it. First click on start menu. Then click on control panel. After that click on change system sound. Now go to start-up sound,un-check it. 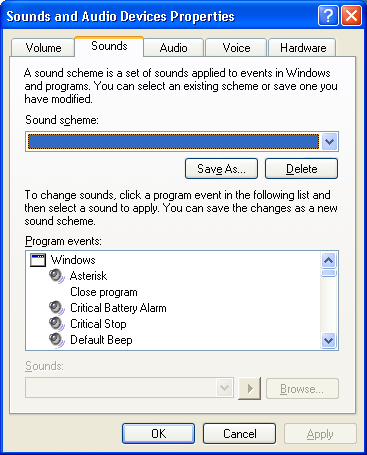 You should follow these steps for disabling start up sound on Windows XP . Go to Start menu button from desktop of PC. Then go to Control Panel from menu just opened . Search for category named as open Sounds and Devices to change sound. Select Sounds tab by clicking on it. You will see a Windows Log on settings which you need to change. Choose Windows Log on and de select Play Windows Log on on Start up settings. 3. select the sound and audio devices. 4.click on the sound tab. 6.click apply to save the changes . At first click on start menu. -->click on "sound and audio device"
-->click on in and go to sound tab and uncheck it..
it is very easy processs do it commenrence of deduced..
*confirm it as not auditable. so easy way to process try it ..
> Click on "Start menu" and click on "Settings"
> Now click on "Control Panel"
> In control panel select "Sound and Audio devices"
> In "Program Events" select "Start Windows"
> Keep start windows selected and go to sounds option and select "None"
Select n the speaker icon. ~> Firstly, open Control Panel from the Start Menu. 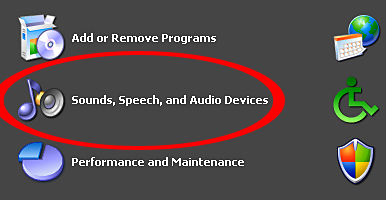 ~> Then, double click on the option "Sound, Speeches and Audio Devices". ~> In the dialog box opened, click on Sounds tab. ~> Now, click on "Start Windows" from the "Program Events" option. ~> After that, select "None" from the drop down list under "Sounds" option. ~> Finally, click on Apply Button to disable to Start Up Sound. then right click on the task bar ...where the sound icon is displayed in the task bar. 2:After that, type in like this, "CHANGE SOUND CARD SETTINGS"
5:After that, you will find a option called, "play start up sound"
8:Finally click on, Apply and followed by OK.
For fix these problem do as i say.. Under Sound Options, click on Change System Sounds. From the Sounds Settings window, un check Play Window Start up sound as shown in the screenshot below and click OK.
actually its pretty easy to disable the windows login sound and related sounds. so you want to turn of the starting sound. this starting sound is known as log on sound. so,for turning it off do follow the steps given below. 4. dialouge box will be opened with the programs associated with different sound. your windows startup sound will be deactivated. Press the keyboard combination Windows logo key + R to open the Run dialog. In the Run dialog, type mmsys.cpl and press the Enter key. In the Sound and the Audio Devices Properties, select the Sounds tab. Scroll down in the list labeled Program events and select Start Windows. >>click on "Sound an audeo device"
You can disable start up sound in window 7..
2-Double-click on sounds,speech and audio devices. 3-Now click on sound and audio devices. 5-Search for Start windows under program events. 6-Click it and go to sounds tab and make it as none. 7-Finally hit on Apply and OK.